Parent Tested Parent Approved Top Pick of Toy Fair 2018 Featured in Purdue University's Engineering Gift Guide Seriously STEM Award Winner Laser Chess is a two-player strategy game that combines the spatial thinking skills of chess with the high-tech fun of laser beams. 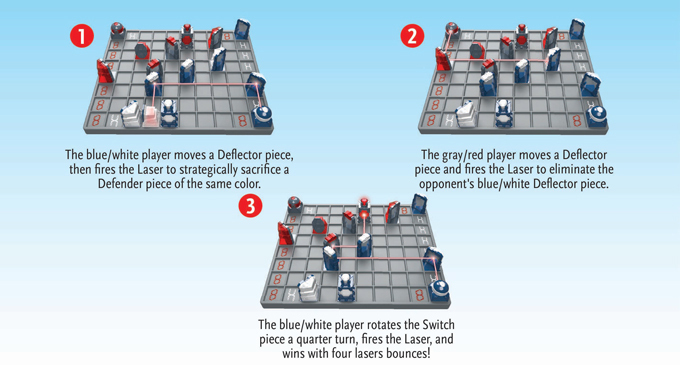 Players alternate turns moving their mirrored pieces around the board, and at the end of each turn, players fire a real laser beam from their Laser. The laser beam bounces from mirror to mirror, and if the beam strikes a non-mirrored surface of any piece, it is immediately removed from play. If you illuminate your opponent’s King - YOU WIN!